Vanadium dioxide exhibits an insulator-to-metal phase transition that is accompanied by strong switching of its near-infrared optical properties. We have demonstrated that vanadium dioxide can be integrated with silicon photonic waveguides to form a compact waveguide-integrated absorption modulator. This project is centered around fabricating low-loss slot waveguide structures that allow for both incorporation of CMOS-compatible gain materials and efficient carrier injection. In addition to potential applications for laser devices, silicon slot waveguides exhibit properties that enhance spontaneous emission rates of integrated active materials for use in incoherent light sources. An evolutionary approach was employed to find energetically favorable candidates starting from a collection of random structures. The algorithm was successfully applied to the problem of determining the atomic structure of surface steps on Si(114). The relative stabilities of different surface reconstructions were determined for hydrogen passivated Si(105) and Ge(105). The (105) facets of the atomic clusters observed with the Ge/Si(001) epitaxial system were found to become thermodynamically unstable in certain hydrogen environments. The energies associated with the interaction of identical and dissimilar point defects were calculated in order to study the organization of such defects on reconstructed Si(001). 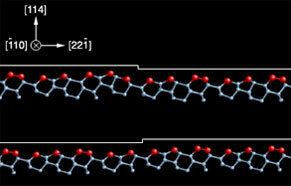 Defects studied include ad-dimers, dimer vacancies, and interstitial carbon atoms near the surface.